I had a somewhat surreal experience today while trying to sort out a variety of problems at the library I was looking after today. I had been trying to arrange a shorter call-out time for engineers to look at the drips of water I’d noticed yesterday with a range of phone calls and emails when suddenly all resistance faded away. Instead of weeks to wait, it was suddenly “as soon as we can”, and two men turned up to see what they could do.I deflected their initial belief that it was a burst pipe by pointing out it only started with yesterday’s rain, and so we climbed out onto the flat room to inspect the affected area. 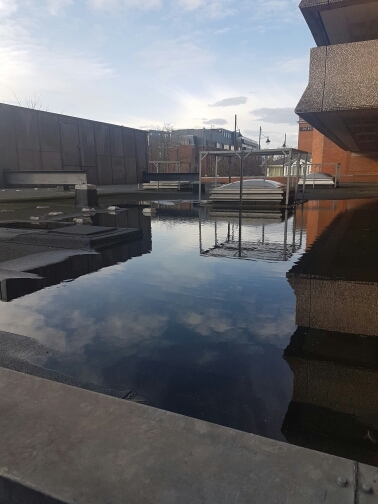 And we found, essentially, a peaceful lake covering a large section of the roof. The drainage pipe was blocked somehow and the rain water had collected there quickly. They tried to clear the blockage and failed, and called in others who were also unable to help. Tomorrow, I’m told, even more engineers will arrive to resolve the problem. The sooner the better, because the damage to the books if that roof fails will be devastating. And yet… There is a part of me that admired the simple beauty of that water on the roof. It reminded me of mountain lakes in the Scottish Highlands that reflect the sky and clouds, bringing beauty to unusual places. Somehow I think it’s an image and whimsy that’s going to stay with me a while. This entry was posted in idle musings, library, work and tagged beauty in strange places, idle musings, library, work. Bookmark the permalink.